SOURCE: “the garden” is based on page 42 of The Great Gatsby by F. Scott Fitzgerald (Scribners paperback edition, 2004). ABOUT THE AUTHOR: George McKim has an MFA in Painting. His poetry has appeared or is forthcoming in Dear Sirs, Shampoo, Diagram, elimae, Ditch, Cricket Online Review, Blaze Vox, The Found Poetry Review Pulitzer Remix Project and others. His chapbook Found & Lost is forthcoming from Silver Birch Press in late 2014. 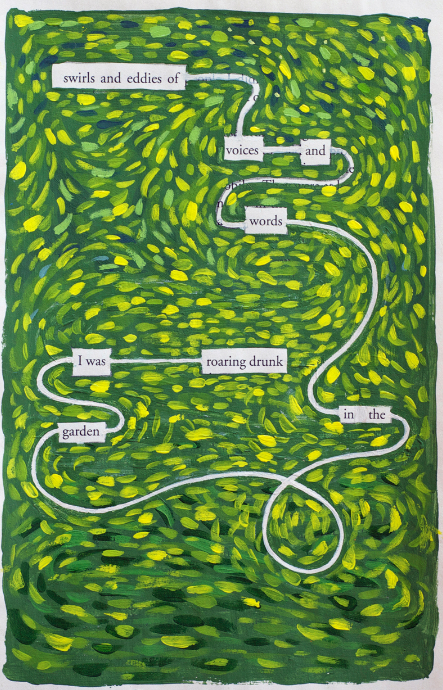 NOTE: “the garden” by George McKim will appear in the Silver Birch Press The Great Gatsby Anthology (April 2015). Your way with few words paints a masterpiece! Bravo!